Lose That Girl: RATE IT! True Gawker! 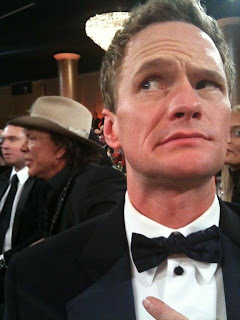 The web is saturated today with the Golden Globes good, the bad and the desperately ugly. To spare you yet another rehashing of the winners, the worst dressed actors, and the number of disses laid down on ratings-weary NBC... I'm gifting you with the most entertaining and silly GG post I could find. Gawker.com wins the prize for their "Blurry Photos: Neil Patrick Harris scared of Mickey Rourke, Jenna Fischer in the can". Snapped by Hollywood stars and wannabees during the festivities, all for the benefit last night of Twitter -- who else! Click through and enjoy! For me, NPH takes the cake.